Hi! I have a Linksys EtherFast Cable / DSL Router with 10/100 4-Port Switch (model: BEFSR41 V.2) - Instnt Broadband Series for sale. 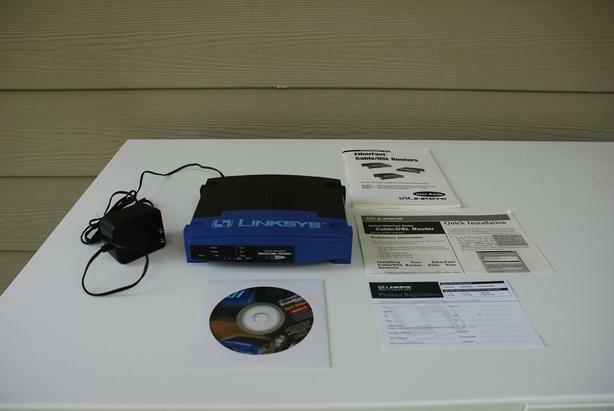 It measures 8"L x 6" W x 2" H. I have the power adapter (model: AD9 / 1C), the User Guide, the Quick Installation sheet, the Tech Helper CD, and even the original registration card that originally came with this router. This router was being used (and it worked just fine) until we moved. Because we downsized - we no longer needed it and so it was packaged away in storage. It was only ever used in a dry, smoke-free, pet-free environment. I am asking $15 for this router. I am located in Vancouver, BC but shipping is no problem. I will be happy to mail this Linksys router to you using CanadaPost and Interac bank transfer. So, if you are interested in purchasing, e-mail me and we'll figure out the logistics and/or I can answer any questions you may have. Thanks!